It can sometimes be forgotten that private real estate developers and investors provide a vital public service. By constructing, renovating or managing properties, they deliver the residential and commercial infrastructure that is necessary for the creation of a thriving local economy. For Dana Holdings – BK, this certainly rings true. As an award-winning developer that has completed more than 1,000 projects, covering over 10 million sq m, Dana Holdings – BK has helped build high-quality urban environments for countless individuals to live and work in. With projects receiving praise from many quarters, it was no surprise when Dana Holdings – BK was listed on the World Finance 100 in 2017 in recognition of its impact in the real estate sector. For Bogoljub Karić, Dana Holding – BK’s Chairman of the Board, the positive work being undertaken by the business represents the culmination of a long personal and professional journey that has taken him from a small city in former Yugoslavia to the upper echelons of Serbian politics. Karić, the youngest son of Danica and Janićije Karić, was born on January 17, 1954, in the town of Peć, located in what was then known as Yugoslavia. The Karić family come from a long tradition of entrepreneurialism that would no doubt have made a strong impression on the young Bogoljub. In fact, records of the family’s work in handicraft and trade sectors can be traced all the way back to 1763. Private enterprise in the Socialist Federal Republic of Yugoslavia, however, was not easily pursued. Although the post-war period did see a reduction in the state management of enterprises, unemployment remained rampant and much of the country’s labour force emigrated to find work abroad. These difficulties, however, did not prevent Bogoljub, his brothers Dragomir, Sreten and Zoran, and his sister Olivera, from pursuing their entrepreneurial instincts. In the 1960s, after further legislative changes, Bogoljub and his siblings founded the first private factory in Eastern Europe and, in doing so, they became pioneers of private business; not only in former Yugoslavia, but in Eastern Europe. Using credit obtained from the International Finance Corporation, the family was able to produce a number of vital tools that had previously been missing from the local market, including tractors, axles and cogwheels. In doing so, the factory enabled the foundation of many other private companies in the region. Within 10 years, the factory grew into a thriving, multi-faceted business. The family’s BK Group soon encompassed an industrial network of 400 sub-contractors, applying western standards of management, responsibility and remuneration to its workings. The group became a phenomenon in the communist world, with both Pravda in Moscow and Renmin Ribao in Beijing writing disapprovingly about the restoration of capitalism in Yugoslavia. Despite the reproach, the Karić family fully believed in its work. Although the success of BK Group has brought Karić and his family significant wealth, the Serbian businessman has been keen to use his financial clout to help others too. Through his founding of the Centre for the Development of Small Enterprises, Karic´ has played a key role in fostering private enterprise in the region. The establishment of the Karić Foundation in 1992 helped provide assistance to refugees, orphans, schools and hospitals through its branches in Moscow, Vienna and London. Similarly, the Karić Brothers Award was established in 1998 to celebrate work in the fields of art, journalism, science, economics and humanitarianism. The reputation of previous laureates is testament to both its national importance and international prestige. The award aims to both celebrate past achievements and inspire new ones. The businessman’s desire to safeguard Serbia’s future was also demonstrated when he established the Alfa BK University – the first private university in Eastern Europe – in Belgrade in 1992. Alongside his brother Dragomir, Karić also founded the International University for Business and Management in Moscow as the first private university in Russia. Over the years, the BK Group has also provided a number of essential services for the Serbian people. Through the creation of TV BK Telecom and then EUnet, the first domestic internet provider, the group helped connect Serbians with each other and the wider world. Similarly, the establishment of Mobtel, the first mobile telephony company in the region, indicated that the BK Group was not afraid to pioneer new services. The Karić family also helped shape the financial landscape in Serbia, other parts of Eastern Europe and even China where they became pioneers of private business when they started activities 30 years ago through their company in Hong Kong. The Karić Bank, later called Astra Bank, opened its doors in 1990 in Belgrade as the first private bank in Eastern Europe. Affiliate banks were subsequently opened elsewhere in the country and abroad, which continued to provide valuable financial services, even as Serbia faced crippling economic sanctions. It was the only private bank that survived the financial chaos that engulfed the country during the 1990s, and in doing so even managed to enhance its reputation. Today, BK Group is one of the largest construction companies in Europe, with current projects valued in excess of €20bn ($24.74bn). As one of the first foreign investment and development groups to recognise the potential of emerging Eastern European markets, BK Group’s Dana Holdings has successfully completed more than 500 projects since its inauguration and is on track to deliver a number of significant mixed-use schemes over the next few years also. In Belarus, as with so many other Eastern European markets, the pathway to sustainable growth begins with a full and productive workforce, although suitable infrastructure is also a major driver. According to Colliers International, the estimated market value of all the projects in Minsk is $3.95bn, while total net operating and sales income is $7.2bn. Minsk World, which is Dana Holdings – BK’s largest development, is a three million sq m mixed-use scheme that is located in the heart of the city, on the site formerly occupied by the Minsk-1 Airport. Construction of the complex started immediately after both the presidents of Serbia and Belarus participated in a groundbreaking ceremony in November 2015. On a site of around 400 hectares, the new Minsk World project is one of the largest mixed-use construction developments in existence in the world today. 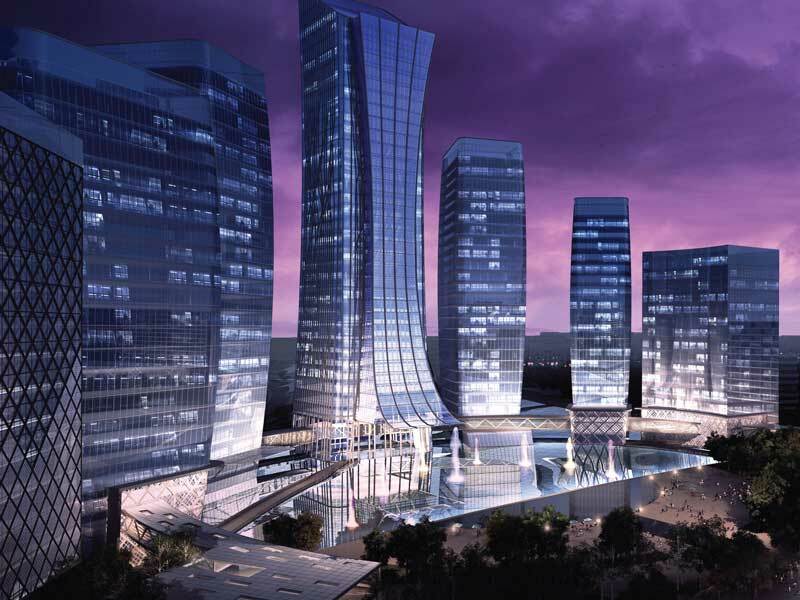 Upon completion, the project will comprise 30,000 high-quality residential units and villas, along with 305,000 sq m of gross leasable area (GLA) of Class A office space, all within a new international financial district that will attract numerous new investors. There will also be: conference, event and leisure centres; schools; lakes and green spaces within a new metropolitan park; and a 120,000 sq m GLA shopping, entertainment and leisure centre. The residential segment of the development is ahead of schedule, while the entire project is on track to be completed by 2029. The project offers strategic benefits for Belarus and will help the country become a regional leader in business and finance, similar to Singapore, Dubai or Hong Kong. Furthermore, Dana Holdings – BK is working in Belgrade to imple­ment its two million sq m Tesla City project, designed to be the leading energy-efficient city- within-a-city development on the planet. There’s also the Astana Royal, which is currently in development. This is another city-within-a-city development that heralds a new centre for living, working and recreation for residents of all ages in Kazakhstan’s capital. Such projects are in addition to the many completed projects that the BK Group has worked on across the former Soviet Union. In fact, during 40 years of operations, the company has worked in more than 18 countries. There is still more work to be done, however. States in Central and Eastern Europe require an estimated €615bn ($760bn) of investment in transport infrastructure just to catch up with countries in the West. For Karić, this shortfall only makes him more committed to future projects, both in his native Serbia and elsewhere. In any case, for the many reasons mentioned above, the Karić brothers have become synonymous with the success and development of private business in Yugoslavia and Eastern Europe. “At Dana Holdings – BK, we only invest in the best,” Karić said. “Whether our partners are based in manufacturing, telecoms, finance or any other industry, we give them support, but also freedom to be creative. In this way, we are helping to change the world, one project at a time.” Indeed, thanks to all they have achieved, the Karić brothers have become synonymous with the success and the development of private business in Yugoslavia and Eastern Europe.